This month marked the centenary of the October Revolution. Much was written in the Western press about how Russia’s new identity and politics could be seen in how it chose to observe one of the 20th century’s most influential events. This month’s TV News in Russia looks at how Russian media covered not only the centenary, but also other major factors now forming Russia’s identity: history, patriotism, Russia’s perceived place in the world, and how it defines the “other” (i.e., America). The telling and fascinating list is below, with extended commentary and links to the original reports. First Channel states that the revolution carried different names over time. These included “The Great October Socialist Revolution” and “The October Coup” (the Bolsheviks themselves used this term the first several years after the revolution). Host Valery Fadeev states that he prefers the term “The Great Russian Revolution” as it has changed the whole world. The channel quoted Duma Deputy Pyotr Tolstoy as saying that Russia would have had great accomplishments if the revolution had not happened. Tolstoy argued that Russia, just a half year later, would have won World War I and would have received, as had already been agreed, major new territories including Constantinople. Further, public school education and electrification would have still been carried out as Nicholas II had already approved these plans. The channel also said that others, such as United Russia member and Head of the Duma Committee of Education Vyacheslav Nikonov, highlight the accomplishments of the Soviet state, saying that after the revolution, Russia became the superpower for the first time in its history. This happened in the 1960s-1970s, and Russia’s share in the global economy was bigger than ever before. At the same time, if the revolution had not happened, Nikonov states, Russia would not have had a civil war, and Hitler would have been much less likely to have come to power in Germany, meaning that World War II might never have happened. First Channel summarizes that the October Revolution greatly influenced the fate of Russia, and the history of all humankind. For example, Trotsky’s ideas helped form the recent “color revolutions” in the Middle East and the neo-con thought in the US. First Channel concluded with extended commentary, saying Russia’s recent history has demonstrated that Russia cannot focus on its past and that attempts to build a world that “without an ideological standoff and struggle between the two systems” only resulted in “a humiliating protectorate for 10 years and new Entente at Russia’s borders.” Host Valery Fadeev said that had there been no revolution, Russia would have likely gone through a bloody dictatorship anyway, as this would have been the only way that Nicholas II could have kept power. Further, imagining that a “utopia” could be built anywhere on earth, where everyone is totally free and happy, is naïve. In the end, the main lesson from the revolution, according to First Channel’s report, is that “violence, even for the sake of well-being of the majority, is unable to solve the systemic problems faced by the state and the society,” First Channel states. First Channel reports that its movie Trotsky was made to commemorate the centenary of the 1917 revolution. “Trotsky’s biography is a perfect fit for a movie: he was a revolutionary fanatic and coined the term ‘Red Terror.’ He was a lover and an exile” First Channel states. A reporter visited the house in Mexico where Trotsky was killed by Spanish revolutionary and KNVD agent Ramon Mercader with an ice axe in 1940, and spoke to Trotsky’s grandson Esteban Volkov, who is 92 years old and remembers his grandfather very well. 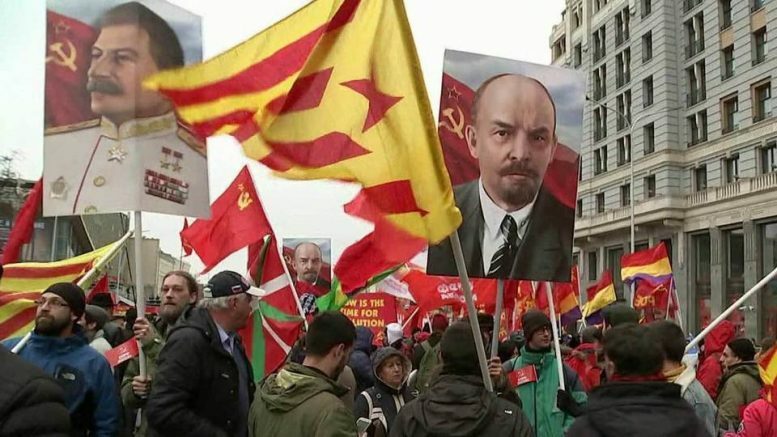 According to First Channel, dozens of thousands of people visit that house, and many of them support Trotsky’s political views. Russia Channel reports that 100 years ago, the Civil War started in Russia. Today, the report begins, the day was widely observed throughout Russia most by supporters of the “left idea.” The channel explained that the war began with fierce fighting between the Whites and Reds on the streets of Moscow. About 1,000 people were killed, mainly military cadets aged 14-20, as well as university and school students. Russia Channel states that their only guilt was that they refused to betray the oath and the country they had sworn to defend. The White Army forces in Moscow had about 7,000 people then, the Red Army had 25,000 people. Of some 30,000 army officers in Moscow at that time, only about 700 officers supported the Whites, other took “wait-and-see” approach, and, as a result, the Whites were defeated. Russia Channel reports that in 2016, 18 million tourists visited the towns and cities of the Golden Ring of Russia. The channel stated that the term “Golden Ring” was first used in 1967 by art critic Yuri Bychkov who published a series of articles about the historical Russian. Then, it included eight cities: Sergiev Posad, Pereslavl-Zalesskiy, Rostov Veliky, Yaroslavl, Kostroma, Ivanovo, Suzdal, and Vladimir. The report described the massive efforts underway to restore and preserve their architectural heritages. It also emphasized that, even as snow begins to fall, that the towns are beautiful and produce extraordinary art and local delicacies. Lastly, it stated that the boundaries of the Golden Ring are expanding as the towns of Myshkin, Uglich, Gorokhovets, and Borisoglebsk, are now included and developing tourism based on the name. First Channel states in its report that the Soviet Union collapsed because the people lost their unity. However, attempts by “external forces” to make the Russian Federation collapse, through supporting the unrest in the Caucasus region, radicals, and terrorists, have failed as “we regained the people’s unity again.” First Channel quotes President Putin as saying that “unity and patriotism have always been the main foundation on which the Russian people stood, in the years of ordeal and when solving large-scale development issues.” The President added that “caring attitude to the motherland, loyalty to sincere friendship and intolerance to any pressure from outside are the supporting structures of the Russian statehood, our genetic and cultural code.” The President and other prominent politicians and cultural representatives laid a wreath to the monument of Prince Dmitry Pozharsky and Kuzma Minin, who gathered an all-Russian volunteer army and expelled the forces of foreign invaders from Moscow centuries ago. Russia Channel reports that millions of people took to the streets on Day of People’s Unity of November 7. In Moscow, the heads of all of Russia’s major religious confessions (Russian Orthodox, Islam, Judaism, and Buddhism) came together on Red Square. It was a rare case when one could hear them making jokes at one another such as, Russia Channel reports, “the Sabbath is on Saturday.” The leaders, with the Russian President, laid flowers to the monument to the Minin and Pozharsky, as “today’s Russia would not have existed if they had not done their heroic deed.” In addition, the channel listed other highlights of the day: in Moscow, 130 thousand people gathered in Luzhniki stadium and all stood up when Soviet icon Vasily Lanovoi sang a patriotic song; President Putin gave awards to Vyacheslav Mikhailov, Nationalities Minister during “the turbulent 1990s” (as the channel called that epoch in its report), and to “foreign citizens who help the world to better understand Russia, despite all the complications and prejudices.” Also, Foreign Minister Sergey Lavrov awarded with Pushkin medal “those people who promote the Russian language and Russian culture.” Big concerts were held in Yekaterinburg and St. Petersburg, and Crimea. A crowd of 50,000 came to the celebration gathering in Chechen capital Grozny, Russia Channel reports. Russia Channel covered the 90th birthday of physicist Yuri Trutnev, one of the creators of the USSR’s hydrogen bomb. In an interview for the occasion, the scientist talked about his memories in creating the bomb and especially how the Soviet technology was better; in the US, the bomb was too big, in a size of a three-storey building, while the Soviet bombs was much smaller and could be carried by bombers to any place in the world. The President of the Russian Academy of Science, physicist Alexander Sergeev, was interviewed and said that the legacy and ideas of scientists like Trutnev are still actively used in the nuclear power industry. Will Arab Spring be Followed by Latin American Spring, and Who is Ready to Redraw Map of the World? First Channel reviewed a new book by French author Thierry Meyssan called Crimes of the Deep State. The station explained that the “Deep State” is an influential part of the American elite which has “used the Middle East as a geopolitical experiment.” The channel continued that, after 9/11, this elite was able “to restrict people’s freedom and put the media under control, and, as a result, today’s degrading state of Western media is easily seen.” Also, “a new form of colonial policy” is being applied which is “destabilizing the world,” “robbing weak countries, but in a new way” and “destroying all major state institutions so that nothing can compete with the USA.” The Channel stated that this is a key part of America’s foreign policy but that Donald Trump is not part of the “Deep State” elite and is working to try to stop the policy that is trying to ensure that “non-integrated states are doomed for chaos.” This includes all Africa, Central and Latin America (except for Brazil and Argentina), the whole Middle East and Turkey, the Persian Gulf, Iran, and Pakistan, all of Central and the South-East Asia, and the Balkans except for Greece. However, the whole of the Deep State is working to undermine Trump, the channel quotes the book as saying. First Channel reports that book is now available in Russian. Desecration of Alyosha Monument: Why Have Social Activists Kept Silent?! Russia Channel reports that President Putin took part in the ceremony of unveiling a new monument to Emperor Alexander III in the park of the Livadia Palace in Yalta. At the beginning of the ceremony, an announcer said that “The monument is unveiled to the ruler who brought peace, glory, development, and stability to Russia, the czar-peacemaker, Russian Emperor Alexander III.” First Channel reports that President Putin, officials of Crimea and Sevastopol, and military cadets were among the ceremony participants. The monument depicts czar Alexander III as wearing a military uniform, sitting, and leaning against a sword. Behind the czar, there is a tower with the two-headed eagle and images of various achievements and the prominent people active during his reign. Also, there is a flagpole with the tricolor which became the state flag under the rule of Alexander III.